Navy blue and white colors are generally touted as an “artists’ weapon” because it allows them to get authoritative with their compositions. Personalized navy & white 42” arc printed umbrellas are sought by marketers who wish to bring that authoritative conviction to their brand messages. 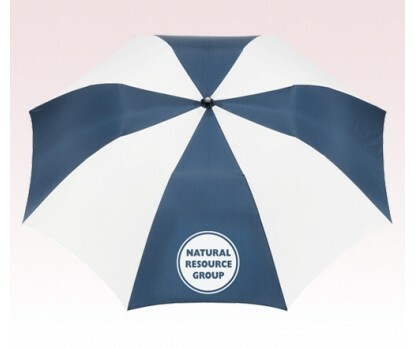 Promotional navy & white 42” arc printed umbrellas make a great gifting choice for marketers in technology, marine and engineering related services because most of them use blue and white in their theme colors. Custom navy & white 42” arc printed umbrellas can be handed out as a festive gift or they can be offered as an encouragement token for purchases above certain value. Features- ergonomic matte black plastic handle with wrist wrap, navy & white pongee canopy with matching color case, and 2 sections folding metal shaft. Dimensions – 42” arc closes to 15”. Imprint area - 6" H x 6" W.